If you look closely at the picture above, you will see two young looking kids on the right. It was June, 1988, and Noble County, Ohio was in the middle of a heat wave. It was 106 degrees, and that young couple loaded up their belongings in the back of a station wagon and headed into their future. 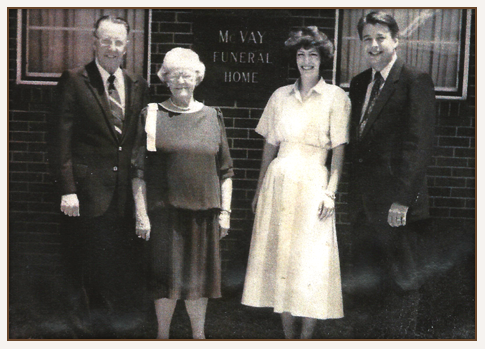 Yes, that would be us: Ken and Robin Perkins, as we began a partnership at McVay Funeral Home in Caldwell with Paul and Susabelle McVay. McVay-Perkins Funeral Home, to us, is not a building. It is a place where we have established friendships that have endured since that hot June day in 1988. It is where friends have evolved into family. And it is where through the toughest of times, we have loved and supported one another. We look a little older now, and we have a few more gray hairs, but we are as optimistic and excited about the future as that young couple in the picture. Thank you for your friendship and kindness to us throughout the years.